On Friday, April 26, The Resolve LRA Crisis Initiative released a report “Hidden in Plain Sight,” documenting the renewal of Sudan’s support to the Lord’s Resistance Army, or LRA, from 2009 until February 2013. 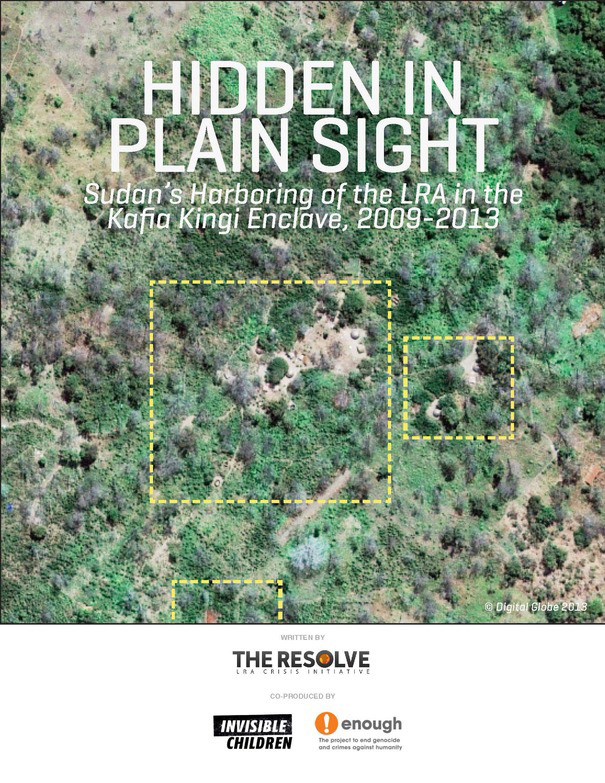 The report, co-produced by The Resolve, the Enough Project, and Invisible Children, reveals that Sudan is harboring the LRA in the Kafia Kingi area that straddles the disputed Sudan-South Sudan border. on the report is based on interviews conducted with former LRA members, civil society leaders in LRA-affected areas, as well as with representatives from the United Nations, the African Union, and governments and military forces in the region. The report presents a historical background about the LRA’s alliance with Sudan, which dates back to 1994, as well as evidence of the Sudanese government’s most recent harboring of the LRA in Kafia Kingi.. Satellite imagery of LRA camps and eyewitness reports from former LRA rebels indicate that the LRA established a series of semi-permanent encampments on the banks of the Umbelasha River near the barracks of the Sudan Armed Forces, or SAF, in the town of Dafak, Sudan. The report presents evidence that these encampments were actively sheltered by SAF. The LRA’s safe haven there enabled the LRA to continue to conduct ruthless attacks against civilians in neighboring countries. With the Ugandan army – the only army actively pursuing the LRA’s top leaders – not able to access Kafia Kingi, the LRA truly found refuge there. In addition to providing a safe haven to the LRA, several sources indicate that SAF also provided military training, weapons, and supplies, further strengthening the LRA’s position. The LRA abandoned the camps in early 2013, but they may still be in the area and could possibly return to Kafia Kingi or seek refuge in Darfur. With the recent coup by Seleka rebels in the Central African Republic, or CAR, compounded by the suspension of the counter-LRA operations, the could provide an additional safe harbor for the LRA in CAR..